Friday night I got to go to my first cage fight known as ‘Xtreme Kage Fighting’ which was put on by The Fight Party. 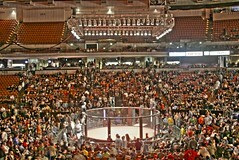 The event was held in a sectioned-off Bilo Center in Greenville, South Carolina. The crowd primarily consisted of the trash you’d expect to see (most of which having shaved heads and beards). It was the same group of people you would see at any bar during a UFC event. Surprisingly enough, there were even a fair amount of families there with younger children, which might explain why there are so many screwed up kids today. Our seats were on the floor about 7 rows back. 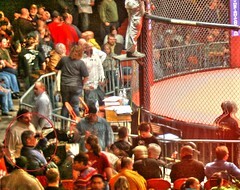 I had perfect view of the top of the cage, an occasional fighter’s head, and the big screen that was about 50 feet up in the air. I managed to snag this picture shortly before losing my ticket and getting chewed out by a member of the event staff for having a “professional” camera. Despite my nitpicking it was a good time, but next time I’ll be sure to either get front row tickets or tickets on the stadium seating. Correction: The man I speak of was not in this picture, he’s in the one below. Click for a larger version. This entry was posted on Saturday, February 6th, 2010 at 9:58 pm	and is filed under Entertainment, Photography. You can follow any responses to this entry through the RSS 2.0 feed. You can leave a response, or trackback from your own site. i fought on this card. got any more?